Another year, another AirFair! This year the day opened with very marginal visiblity, but that didn't stop the airplanes from arriving. Throughout the day, the visibility improved and more and more airplanes arrived. All types of airplanes - antiques, classics, homebuilts, and modern craft. A WW-II Stearman trainer was hopping rides, and was kept busy all day. Attendance was excellent, and our car parking area pretty much filled up. It's wonderful when the weather cooperates! We had several groups of volunteers helping out this year. 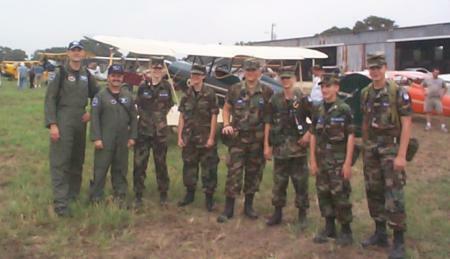 The Civil Air Patrol's Randolph Composite Squadron performed yeoman duties, helping out with aircraft parking and concessions stand cooking. The Scouts were also on hand. Troop 100 from Lackland, and Troop 243 from Seguin faced the overwhelming task of fitting all the arriving cars into the available parking area, and did a fine job. Troop 317 from Seguin was also present and running a snow-cone stand. All the Scouts held a rock party the night before the show, picking up rocks - lots of rocks! In addition to the outside help, many of the usual PFM volunteers helped out as well, giving talks about the PFM aircraft, manning concessions, auction, membership and souvenir sales tables, and giving rides on PFM vehicles. Our thanks to all! Antique car clubs also showed up to put their perfectly-restored vehicles on display. We had cars from all eras, ranging from an early Model-T racer all the way up to muscle cars from the 1960s. An Indian and an Excelsior motorcycle were also present and puttering around during the day. We also welcomed the return of the historical re-enactors. The Border Period was represented by the Border Squadron, showing what camp life would have looked like on the Texas border in the decades before World War I. The Western Front group also set up to represent a German Army machine gun post on the front lines against France during WWI. Their machine gun firing practice rounds was a noisy presence throughout the day, thrilling the kids who got a chance to fire a few rounds. This year, we had activities scheduled throughout the day, starting in the morning with radio-controlled aircraft demonstrations by the Tri-City Flyers model R/C club. They brought out several period models to fly, including a Fokker D.VII and a partially-complete Sopwith triplane. Once their flying demonstration finished, the model aircraft flying field was taken over for aircraft parking. Shortly thereafter, attention shifted to the PFM aircraft as volunteers began to give brief talks about each one. The high point of AirFair, of course, is the airplanes. All of the PFM collection was on display, and PFM volunteers gave presentations about each one at scheduled times during the day. These were well-attended, and after each plane's story was told a question-and-answer period was held. Bill Broussard of Team Fokker gave talks about both the Fokker D.VII and Dr.I; Richard DesChenes (PFM's hot-air specialist) talked about the Bleriot XI and the Thomas-Morse Scout; Bill Bahr talked about the Pietenpohl Sky Scout; and Roger Ritter talked about the Curtiss Canuck. 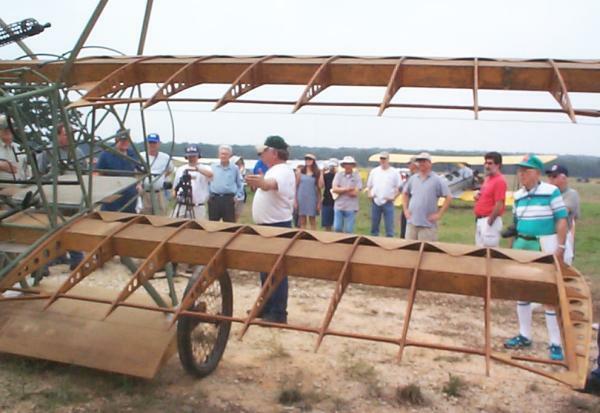 The crowds welcomed the chance to learn more about the early aircraft and the difficulties that pilots and aviation pioneers faced in the days when so little was known about flight. Audience questions ran the gamut from asking about technical details of the aircraft themselves to questions about how the planes fit into the history of the times. At lunchtime, we held the parades. First was a Parade of Flight, in celebration of 100 years of powered flight. Opening with the Thomas-Morse Scout (it was too windy to fly the Bleriot, unfortunately), a series of airplanes took to the air to represent the history of flight from the earliest days to the present. Each airplane flew in its turn, taking off in front of the crowd, making a series of low passes for photo opportunities, and then landing. The Tommy stole the show, of course, especially since there was a slight crosswind. In order to land into the wind, the Tommy's approach was low and hidden behind the main hangar, leaving some of the folks present wondering if all was right with this landing. All was indeed OK, and Roger Freeman was able to taxi the Tommy off of the runway to make room for the next plane to take off immediately. The Parade of Flight was followed by the Parade of Autos, and the Tin Lizzy club drove their finely-restored old cars through the display area prior to their early departure for home (to make sure they had plenty of daylight for the trip). Airplane talks continued throughout the afternoon, providing a chance for those who missed a favorite in the morning to catch up with it after lunch. The re-enactors continued re-enacting, the Nash Quad continued giving rides, and the silent auction attracted its final bids. By the end of the day, we knew we had had a successful AirFair, with hopes for an even better one next year!